Because it’s only one hour tour included training, it is the shortest Segway PT tour in Lahaina town we offer. 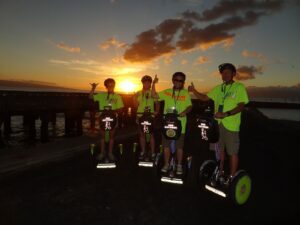 You will have the opportunity to glide to Lahaina and back in a shorter time while having a blast on Segway PT. My husband and I were celebrating our 25th wedding anniversary and decided to do a Segway tour as one of the activities. This is something that I have been wanting to do for quite some time and saw a brochure and jumped at the opportunity. We were pleasantly surprised at how easy it was to learn how to ride a Segway largely due to our instructor John. He was very detailed and patient with us and made sure we knew how to ride it with confidence. He was encouraging and took us on one of the best tours I have ever experienced. We rode on Front Street in Lahaina which was amazing. We had pictures taken by the ocean and bought one so we can remember our adventure. Highly recommend this tour. It was about 1 hours long. Next time we will go for the 3 hour tour. It was that good! This was my second experience doing Segway. Previous one was in Granada Spain which I rated outstanding due to price and length and variety of the adventure. In comparison, this trip was shorter and more expensive but still fun and I would recommend it. This outfit is very safety conscious and the guides do good training and make you watch a 8 min video and wear vest and helmet as should be expected. The guide was good, knowledgeable of the area history. We learned a lot of interesting facts and we had a good time and saw a lot of interesting places along Front Street. My only complaint would be that the training time came out of the 60 minute scheduled trip (even though we showed up 15 min prior to apt time as directed) so that we really only had an hour ride time. Considering the price, this is why I only gave it a very good rating instead of outstanding or excellent. We did a one hour tour, I wished we had booked a longer tour. For the first 30 minutes John, our tour guide, trained the 4 of us and another family of 3 to ride and control the segways. Then off we went, he is fun, very informative and fit a lot in. I would have love 30 more minutes so, the tour would have been longer and id have learned more history. The teens loved it too, put them both in a good mood for the day! We always like to find at least one new activity every time we travel. Our teenage son has long wanted to try a Segway – us too! – so we booked it with Segway Maui. We totally loved getting a chance to ride on these – the training and tour with John was super fun, interesting, and educational, all at the same time. The first half hour is spent making sure everyone knows how to operate the Segway safely, and then, you’re off! We saw places in Lahaina we might not have found on our own, like the Lahaina Jodo Mission and learned much about the area we didn’t know from prior trips to Maui. The Segways are easy to operate – one of the people in our group was initially very nervous about riding a Segway, and she did just fine on it, and ended up having a great time. The time on the Segways went by really fast, so if you can swing it, I’d recommend you do a longer tour, like we will next time. John took pictures of the different families/couples in the entire tour group, which are available for purchase individually or multiples, which is a nice add. Also, FYI, they provide all the safety vests and safety helmets for the ride. We will totally come back and do this again, as my teen thoroughly enjoyed this experience, and so did we. Thanks John and Segway Maui!